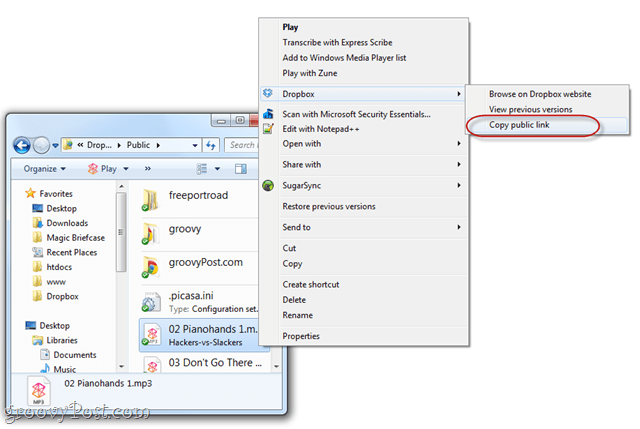 Right-click the file and choose Copy public link. 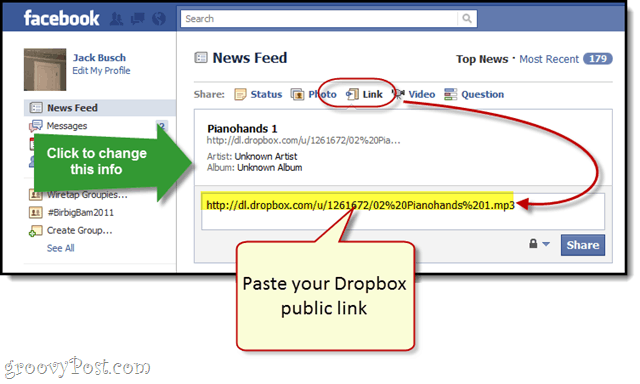 Paste the link into a new Status Update or Link on Facebook. Facebook will automatically detect that it’s an audio file and give you a field to enter the artist name and album, if you’d like. Post it. Now, the item will appear with the link, the artist/album info and handy dandy blue Play button. Stream away! I use this method for sharing original / hard-to-find songs on Facebook one at a time. It works great, it’s free and simple. 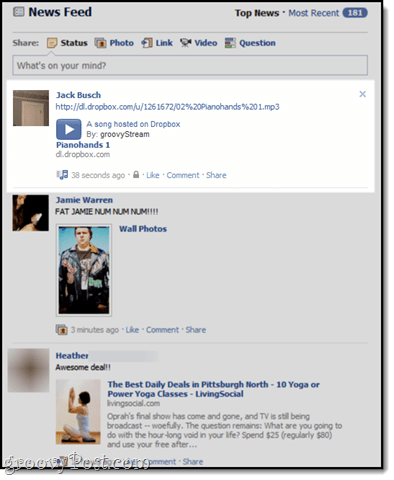 Plus, Facebook is a great place to promote your band using one of the bajillion Facebook Band page apps available. Like I said, Dropbox is groovy if you know how to use it. Shortly I’ll be sharing other groovy ways to use Dropbox so stay tuned! Great! The whole is more than the sum of its parts. I’m curious if it will work once your in SYNC like Wofgang mentioned. You good? 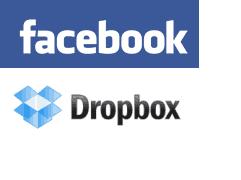 Great idea though, looks like I will be able to use dropbox + Facebook to deliver my podcasts. How can I let others copy my mp3’s using dropbox without making them stream it? 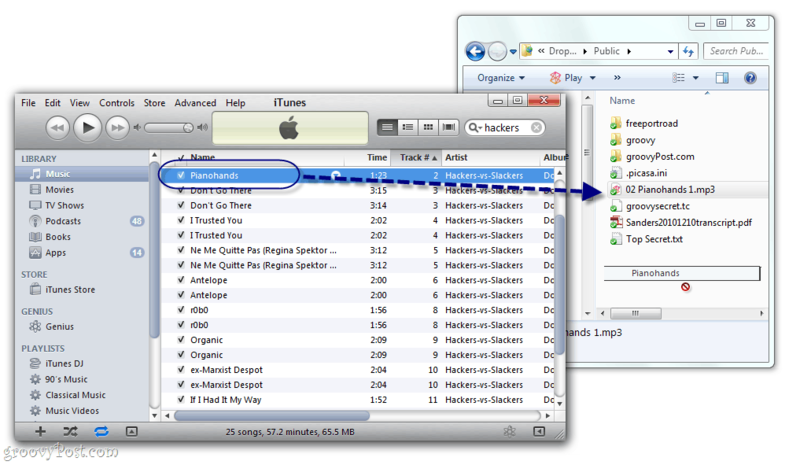 I could delete the mp3 extension and then have them put it back on on the other side, but I’m hoping there’s another way. Any ideas? Does it work or doesn’t it? The “handy dandy blue Play button” does not show (unless I have done something wrong?). It would be great if somebody could come up with a clear answer. This no longer works. All the user gets is the ability to download it. You cannot stream the file. I had trouble doing this recently, couldn’t get it to play the song. After a lot of searching, I started using ez-converter.com to convert my audio into video, and posting it that way. ez-converter.com is a free online service that doesn’t require registration or any personal info.